Join us in Nelson County for a one day workshop to learn about our recent successes and upcoming challenges. The workshop on April 13, 2019, will start at 9am and end at 6pm. 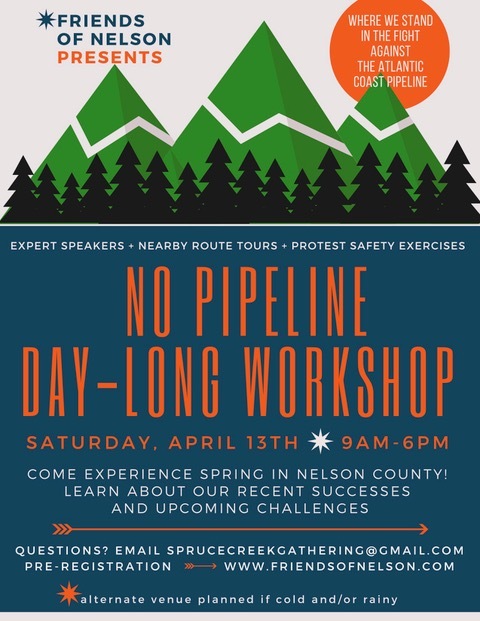 The workshop’s focus is to bring citizens up to speed on the current state of the fight against the Atlantic Coast Pipeline and to further inform and educate them on specific pipeline issues. Besides the list of speakers and topics (below), we will have guided tours nearby of the proposed route, exercises on how to protest safely, and a group discussion on the path forward for those opposed to this 7.8 billion dollar boondoggle project. Attendees are encouraged to bring their own lunch and a camp chair to sit in. Box lunches available with advance order – see registration form. Water, comfort station and a first aid tent with emergency phone service will also be available. If there is inclement weather, we will have an alternate indoor site available. Jennifer Lewis – Augusta County’s water supply is at risk due to its Karst topography and the pipeline route’s proximity to the Staunton Reservoir. Tom Hadwin – Why the ACP is not needed, particularly in the Hampton Roads area. This entry was posted in Citizen Activism, Events, Take Action on March 8, 2019 by Ellen Bouton. Spruce Creek and cutting through the heart of Nelson County’s valuable tourist venues. Spruce Creek Camp is located off of HWY 151 across from Bold Rock Cider. You will see a large no pipeline sign at the intersection of 151 and Horizon’s Village Road. Follow the signs from there. To reduce costs, please bring your own packed lunch and a camp chair to sit on. If desired, boxed lunches will be available for sale in advance. An email reminder will be sent and you can register for a box lunch at that point in time. Water, comfort station and a first aid tent with emergency phone service will also be available. 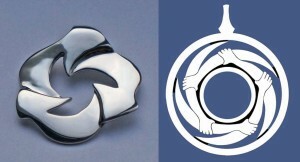 This entry was posted in Citizen Activism, Events, Take Action on February 26, 2019 by Ellen Bouton. 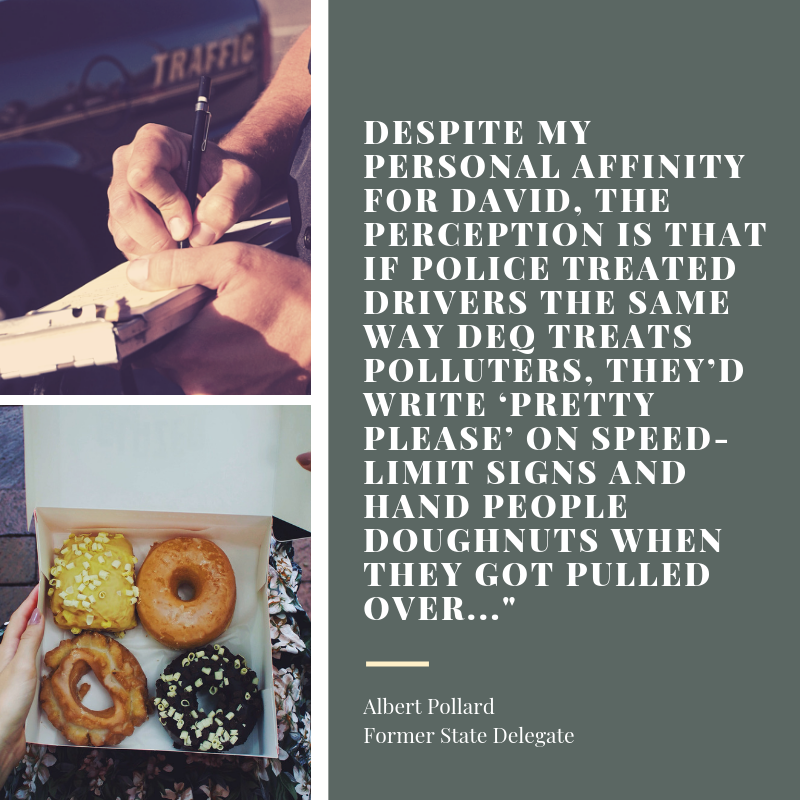 There are serious ethical and conduct issues surrounding Mr. Paylor’s work, especially in the permitting processes connected with the Mountain Valley and Atlantic Coast Pipelines. 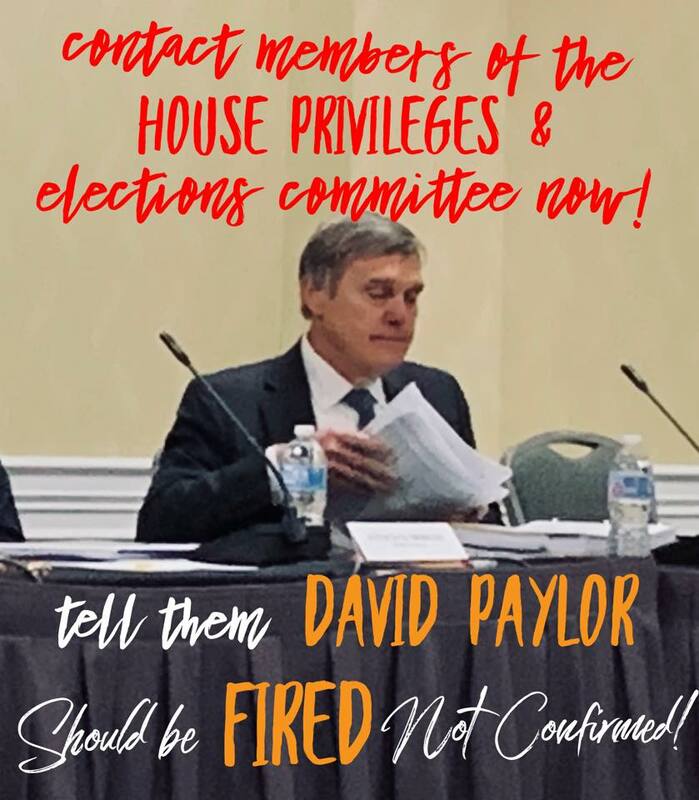 Act now to oppose David Paylor’s confirmation as Director of the Virginia Department of Environmental Quality! The vote on his confirmation reached the Senate floor and the press on January 21, 2019 (Six senators vote against Northam’s pick to lead environmental agency). While the House of Delegates may not act on this until after cross over/Feb. 5, they could act at any time. They could act today. Call and email your own Delegate to the Virginia Assembly (Who’s my Legislator? ) and as well as members of the Privileges and Elections Committee. Ask them to oppose the confirmation vote on the appointment of David Paylor as Director of Virginia Department of Environmental Quality as designated in Senate Joint Resolution No. 292 (offered Jan 9, 2019) confirming appointments by the Governor of certain persons communicated May 17, 2018. This entry was posted in Air Quality, Take Action, Virginia government, Water Quality on January 23, 2019 by Ellen Bouton. As you write your comments to the Air Pollution Control Board during this abbreviated comment period (now through January 4, 2019), you may find some good talking points in the summary of comments made during the August-September comment period. 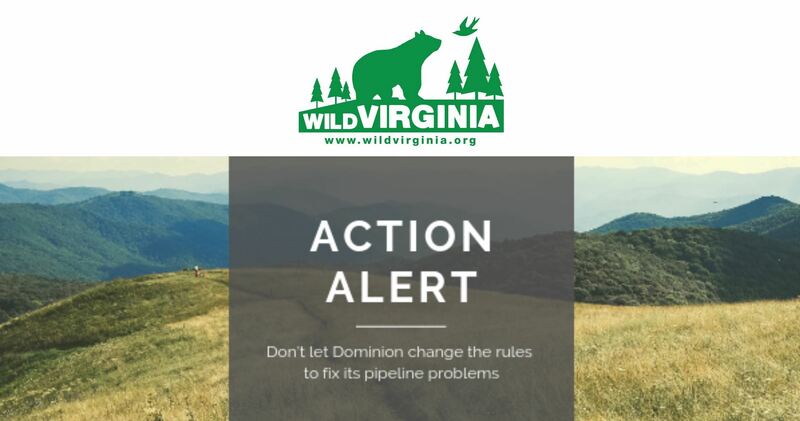 The summary, originally published on November 2, 2018, was compiled with the excellent work of folks from Appalachian Voices, Friends of Buckingham and the Sierra Club Virginia Chapter. Keep in mind that per the Air Board’s instructions, comments are limited to questions and concerns on demographics and site suitability for the proposed air compressor station. The Board also said that the permit conditions, including the amendments that were discussed and approved at the December 19, 2018, meeting, are not subject to public comment. And further, the Board indicated that public comment is not being sought on the conduct of a health assessment by the Virginia Department of Health. Documents to be commented on are listed here. Despite the Air Board’s restrictions, the summary of earlier comments may provide you with useful points to consider. This entry was posted in Air Quality, Certificates of Approval, DEQ, Environmental Justice, Take Action, Virginia government on December 27, 2018 by Ellen Bouton.